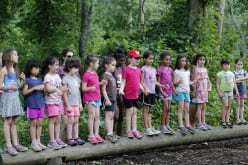 Yeladim campers are divided into age-appropriate groups. They participate in both instructional swim lessons and free swim daily. Campers also enjoy a variety of additional specialist activities each day such as nature, music, sports and crafts. Learning to swim in our indoor pool with Red Cross Safety Instructors. Camp-wide activities connected to weekly themes which may include carnivals, parades, special sporting events and holiday celebrations.